Well when we got Wobble Bear Says Yellow I most certainly was not expecting D to become so attached to Wobble Bear, he point him out on every page! Wobble Bear says Yellow is all about a little bear called Wobble who just loves to say yellow and it is his favourite colour. 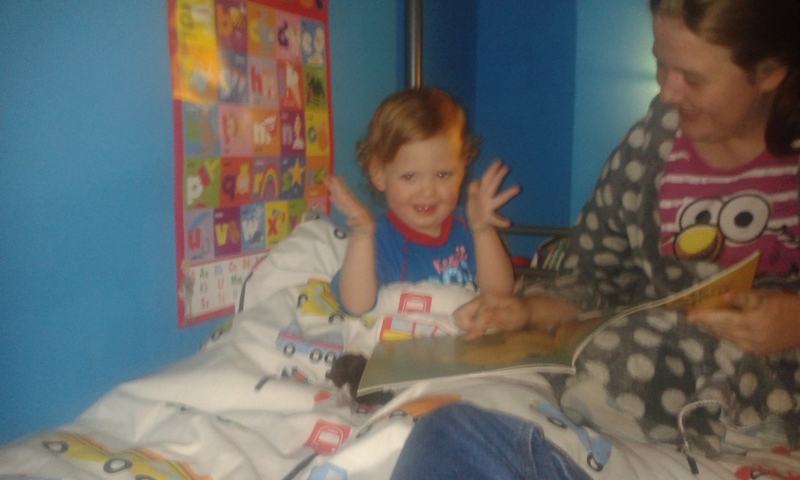 He believes every colour is yellow and doesn't listen to his mummy bear telling him what each colour is. He does get it right once though! I must say we all love this book, it is just so fun loving and the same as any child who has just learnt to say a new colour. We have been reading this every night for around 5 weeks and although D should now be bored of this book he still picks it up before any other and will sit patiently waiting for me to finish what I am doing so I can read it to him. 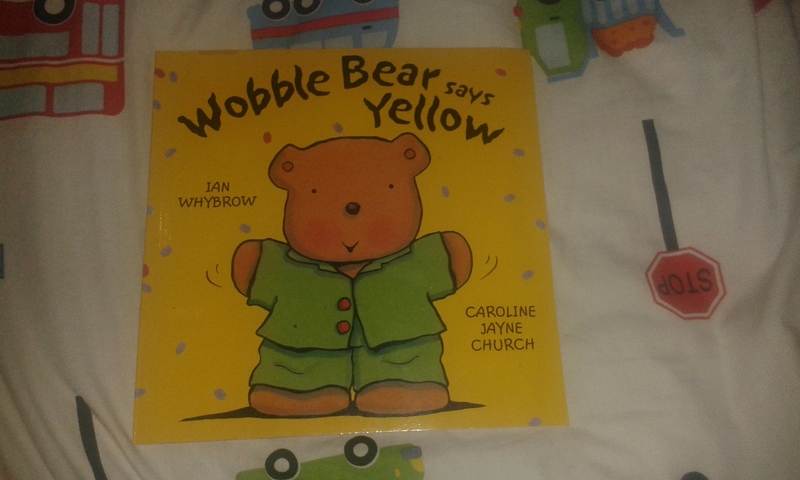 Wobble bear says yellow is a wonderful book for toddlers who are learning to say and recognise their colours. Wobble bear is a character children can relate to. He is very good at making children laugh, defiantly for D anyway! I feel that wobble bear is a great teaching tool for bedtime reading with young children who are learning about their colours. It's a great way to fill their little heads with information right before their short term memories turn into long term ones and this should help in the learning of colours. 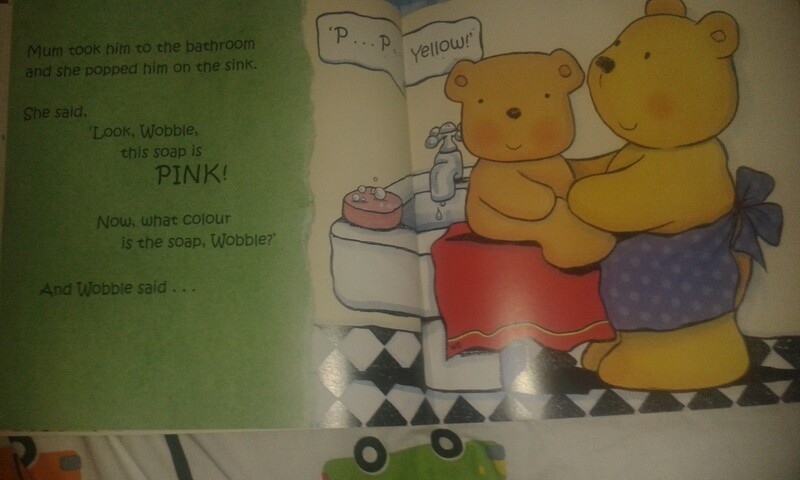 I do think that wobble bear says yellow has some beautiful and simple illustrations that clearly show all the items that mummy bear tells wobble the colours of and these items are always very forward in the picture. D is always able to find and recognise each item as we read through the story. He also has a great sense of self achievement when he is right and I think this book has built up a bit more of his confidence so I would have to say we do recommend this book for any toddler's out there. As you can see below we really love Wobble bear says yellow.